BEIJING, Aug. 31,Chinese President Xi Jinping on Friday met with South Sudanese President Salva Kiir ahead of the 2018 Beijing Summit of the Forum on China-Africa Cooperation. China and South Sudan have seen steady progress in cooperation in various fields since the establishment of their diplomatic ties, Xi said, noting that China is willing to work with South Sudan to enhance bilateral relations. Xi said China always makes it a priority to help South Sudan achieve national stability and development, and welcomes the signing of a comprehensive peace deal by all parties in the African country. China will continue to support the peace process in South Sudan, safeguard its legitimate interests on multilateral occasions including at the United Nations, and provide support for African regional organizations' mediation mechanisms on the South Sudan issue, he said. "China is ready to strengthen cooperation with South Sudan in such areas as infrastructure and agriculture, and to encourage more Chinese enterprises to participate in the country's economic and social development," Xi added. Kiir said South Sudan highly commends China for treating all countries as equals in international affairs regardless of their size and supporting all countries in independently choosing development paths in line with their national conditions. He appreciated China's efforts to facilitate the domestic peace process in South Sudan and its significant role in safeguarding world peace and stability. 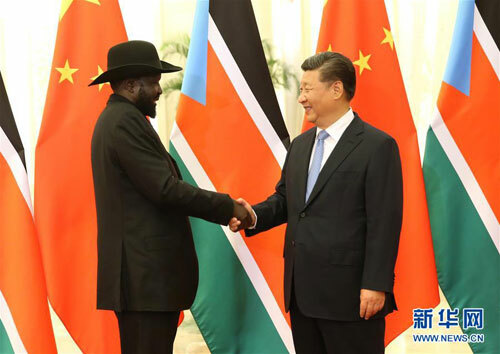 "South Sudan is willing to strengthen pragmatic cooperation with China in areas such as political exchanges and energy, and have closer communication and coordination in international and regional affairs," Kiir said. The two leaders witnessed the signing of bilateral cooperation documents after the meeting.